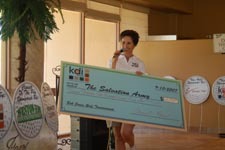 PALM DESERT, CA - A former "Bell Ringer" for the Salvation Army was recently honored by KDI Kares volunteers, who held a charity golf tournament in his name. 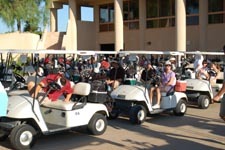 The first Robert Jones Memorial Golf Tournament raised $12,194, which was given entirely to the Salvation Army Davis Center serving the Coachella Valley. The event was sponsored by KDI Kares, the non-profit arm of KDI Elements, which reaches out to charities and the needy of the community. According to Jessica Doria, Salvation Army Captain, the money will go to local families needing help such as emergency food, rent, utility and prescription assistance. "We are seeing more Valley families in need these days and this donation will really make a difference," said Doria. "It's a blessing to know KDI Kares was able to get a tournament together and donate to the needy families of our community." Robert Jones was the father and grandfather of two KDI Elements employees. He was an avid golfer and a yearly "Bell Ringer" for the Salvation Army, which was one of the many charitable organizations he donated to. 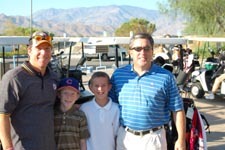 Forty-five golfers participated in the 18-hole scramble tournament, held on September 8, 2007 at Cimarron Golf Resort in Cathedral City. The funds were raised through tournament fees, lunch sales, tee and contest sponsorships. Carl Tuttle, Larry Malestic, Mike Mumey and David Walczak were the tournament champions. 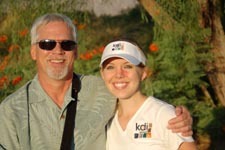 KDI Elements, which is one of the largest employers in the desert, matches dollar-for-dollar funds raised by KDI Kares. The company plans to make the Robert Jones Memorial Golf Tournament, benefiting the Salvation Army, an annual event. For more information on KDI Kares (a non-profit 501 © 3 corporation) visit www.kdikares.com or contact Pat Shapiro at 760.345.9933. Mike Jones (Robert's Son and Sam's Dad) ), Sam Jones (Robert's Grandson), Nick Jones (Robert's Grandson), Steve Jones (Robert's Son and Nick's Dad). Annie Klein holds the check for $12,194 made out to the Salvation Army. © KDI Elements 2007 - 2019. All rights reserved. Created, Hosted and Maintained by IMC Inc.